The TAP Capital Folder is an elegant event folder, perfect for corporate events, dances, and other gatherings. 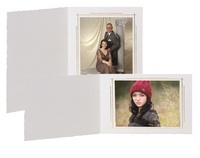 The TAP Capital Folder is perfect for event photography with on site printing with the bottom loading, 'quick load' design. Complete your photo packaging by adding foil imprinting with your studio die and the name and date of your event. Customers who purchased a TAP Whitehouse Folder also purchased these items.